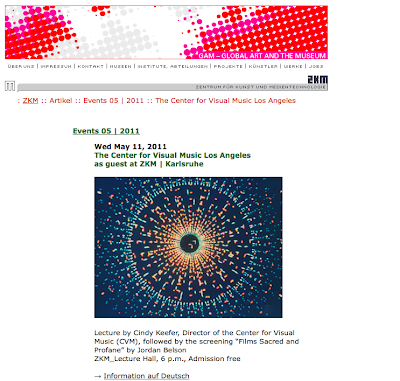 CVM at Zentrum f�r Kunst und Medientechnologie, Karlsruhe, Germany May 11. Cindy Keefer, Director of the Center for Visual Music Los Angeles, will discuss and screen work by pioneers of kinetic art and pre-digital cinema from CVM's archives... Keefer will screen work from CVM's archives including Dockum's �Mobilcolor Projections,� Bute's �Abstronics� (an early oscilloscope film), a short Bute documentary, the Fischinger �Lumigraph Film,� and more. She will discuss CVM's work with the Fischinger legacy, current preservation work, and �Raumlichtkunst,� the new restoration of his 1920s multiple-projector performances.